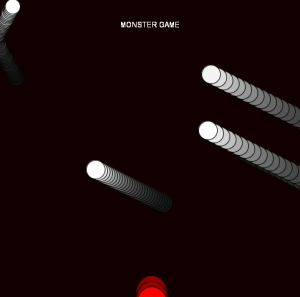 This is my monster game, The player is the monster which is represented with a big red circle. The player starts at the bottom of the screen and his goal is to reach the top while touching the white circles which are the moon children. Once you touch them and reach the top you accomplish the mission. White circles are bouncing around the screen and one of the circles is the determinant of day and night concept. 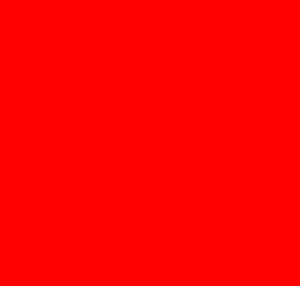 Once it is a red screen it means its day and that is why the player is unable to appear. It only comes at night and that is when it can eat all the moon children and win the game. While I was working on this game I have created 2 classes and it was my first time dealing with them so it was a bit of a challenge. It was suppose to be just a black and white game but because I wanted to show that monster breaths fire so I decided to go with red which is also the color of day time on my game. I added a timer as well so that player can see it. It was also my first time using timer as well.